The Butler Library is the library of the Esperanto Association of Britain (EAB), named after Montagu Christie Butler (1884-1970). It is housed with the EAB office at Barlaston, near Stoke-on-Trent. 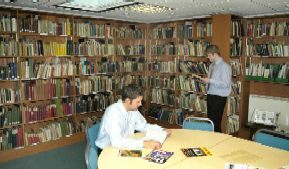 The Butler Library has around 13,000 books and many other documents about Esperanto. More information about the library can be found on a separate website, which belongs to the librarian Geoffrey King. Members of EAB can visit the library for on-site study. However it's necessary to book your visit in advance, because the room is also used for other business, meetings, etc. ; see the details in the contact us page. Visit the dedicated website of the Biblioteko Butler. Visit the Biblioteko Butler Sonbanko (sound archive). The detailed catalogue of the Butler library has around 6700 records. The concise catalogue of the Butler library has around 13600 records. The bibliography of translations from English doesn't directly relate to the Butler Library, but can be helpful when researching books; it has around 2500 records of Esperanto translations which have appeared as separate publications or as articles in periodicals or anthologies. The current search engine is very simple: you have to search for complete words, exactly spelt, and the search tool doesn't distinguish between different record fields. For example, if you know the name of the author and a word from the title, you can give both as search terms. All accents are ignored, apart from the Esperanto ones, which you can also type as a following X: e.g. "Pauxlo" instead of "Paŭlo". Change cx -> ĉ, etc. Download the catalogues (as a ZIP file). EAB used to operate a lending library (Bendoteko) of around 300 audiocassette tapes and 20 videocassette tapes. Those materials are now held in the Butler library collection, and we are working to digitise the more popular recordings so that they can be made available as part of the Butler Library Sonbanko online archive of Esperanto recordings. Several Esperanto recordings on CD or DVD are also available from the EAB bookshop. There are several other important public collections of Esperanto books in Britain. The British Library has an Esperanto collection; there is a brief description on vikipedio and the curator/cataloguer is olga.kerziouk bl.uk . The National Library of Scotland has the William Auld collection, within the "Special and Named Printed Collections in the National Library of Scotland". The TUC collection in the London Metropolitan University has some Esperanto pamphlets and books; enter search term "Esperanto" in the catalogue keyword search. The Esperanto Museum in Vienna, part of the Austrian National Library, (isn't in Britain but) has collections which include many British Esperanto publications. Some of these have been scanned and can be accessed online.